Back : Ron Hart (Manager), Tony Lewis, Geoff Mudge, Tim Bungay. Front : Ross Gilbertson, Ken Middleditch, Allan Kidd, Norman Strachan. 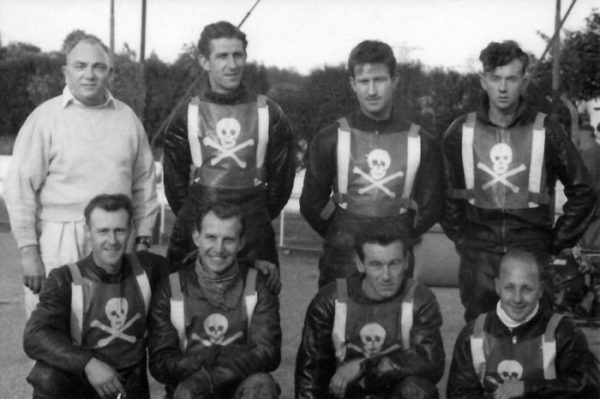 The fledgling Provincial League saw Poole improve on their runner’s-up finish in 1960 to become convincing winners of the 1961 championship title with Ross Gilbertson, Tony Lewis, and Ken Middleditch providing the side with a trio of double figure heat leaders. Fast improving Geoff Mudge also improved with every match to end the season with an eight point average, making the Pirates the side to beat. There were even some pundits who said that Poole were too strong and should be racing in the top division. Tim Bungay proved to be the find of the season and was so good that Allan Kidd and Norman Strachan’s struggles were overlooked and the management could allow Colin Pratt and Peter Vandenberg to move on to other clubs. Although their league campaign started badly with two away defeats Poole remained unbeaten at home, running up nine scores of 50 plus from their ten matches, with Plymouth the only side to pose them any problems around the Wimborne Road circuit. Ross Gilbertson headed the team’s averages with a formidable 10.56 which included 10 maximums, with support coming from the ‘old firm’ of Ken Middleditch and Tony Lewis. Middleditch also picked up 10 maximums to finish with a 10.16 average, while Lewis picked up 12 perfect scores to end on the 10.12 mark, and although Middleditch announced his retirement at the end of the year, Poole still looked in good shape for the following year thanks to the management’s junior rider policy.